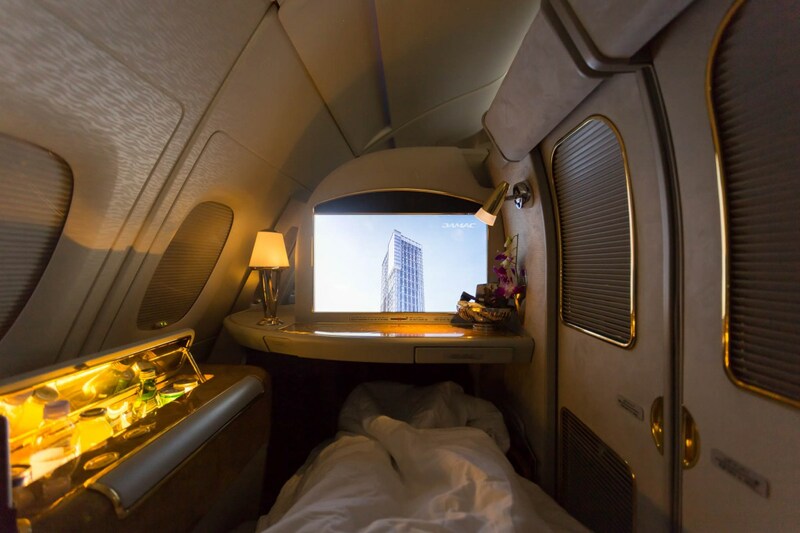 The First Class suites aboard the A380, although geared to appeal to ones most luxurious senses, does not match up to the brand-new First Class suites on the new Emirate’s Boeing 777 which takes poshness to a whole new level and leaves the competition far behind. However, if the definition of First Class to you is the ampleness of your personal space onboard an aircraft, mood lighting, soft leather upholstery, a well stocked individual beverage bar and an option to enjoy a shower 40,000 feet in the air, then, this is it. And the high standards of service that are offered on board, makes Emirates stand tall above the rest. Our Chief purser Violet, charming and ever-so elegant, introduced herself and guided us to our suites. As we settled in, we brought to life the award winning ICE entertainment on our large TV screens with over 3500 channels of movies, TV shows, music and games to choose from. 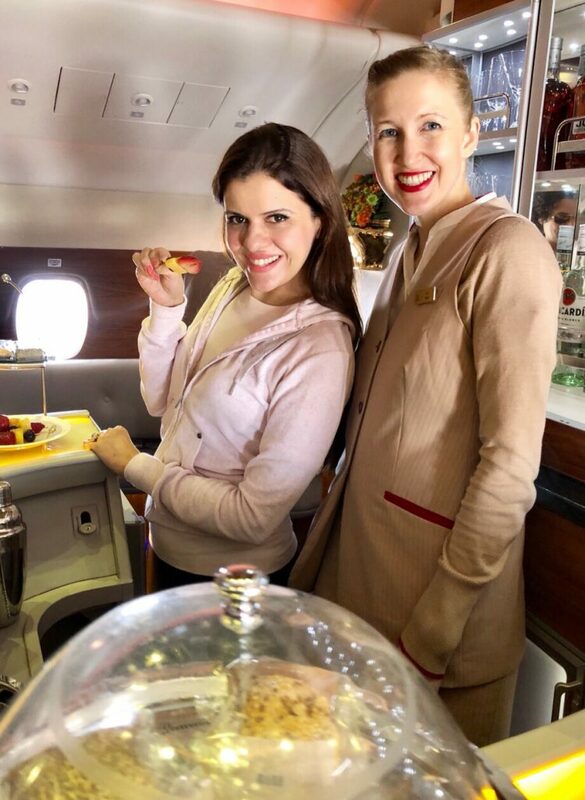 Sara, from the UK, introduced herself as the stewardess who would be attending to us on this flight, and she offered us a glass of Dom Perignon champagne to start of our journey. But this was not any ordinary champagne. It was from the 2000 vintage, P2 (second plenitude) collection, aged between 12-14 years. I couldn’t think of a better way to begin our flight and was excited about the 15 hour long flight to San Francisco. After I was done with my first glass, I was offered a second, which I politely declined, even though I immensely enjoyed the drink. 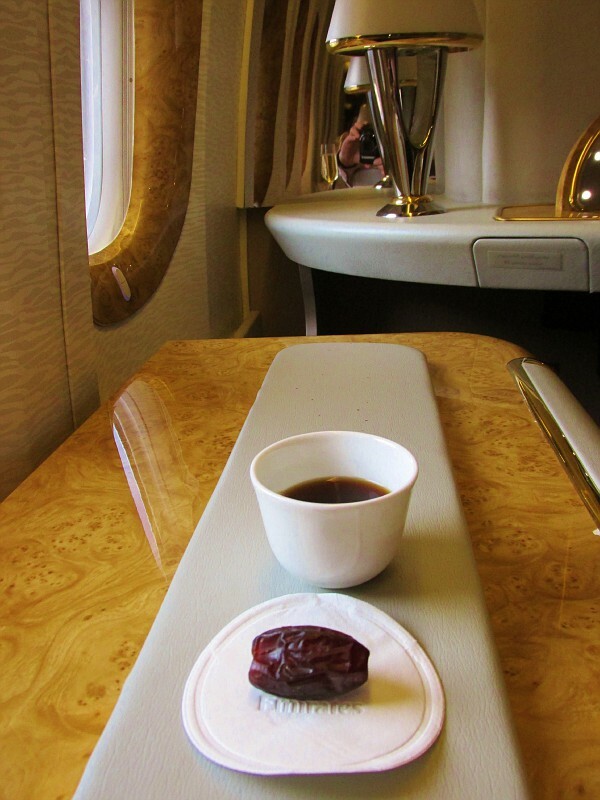 I preferred to try the Arabic Coffee which was offered along with dates. And enjoy I did, for a few hours later, I requested the crew to prepare my shower. I was told that the shower operated on a timer and that I had the option of stopping and re-starting the water flow and hence the timer, while soaping myself. 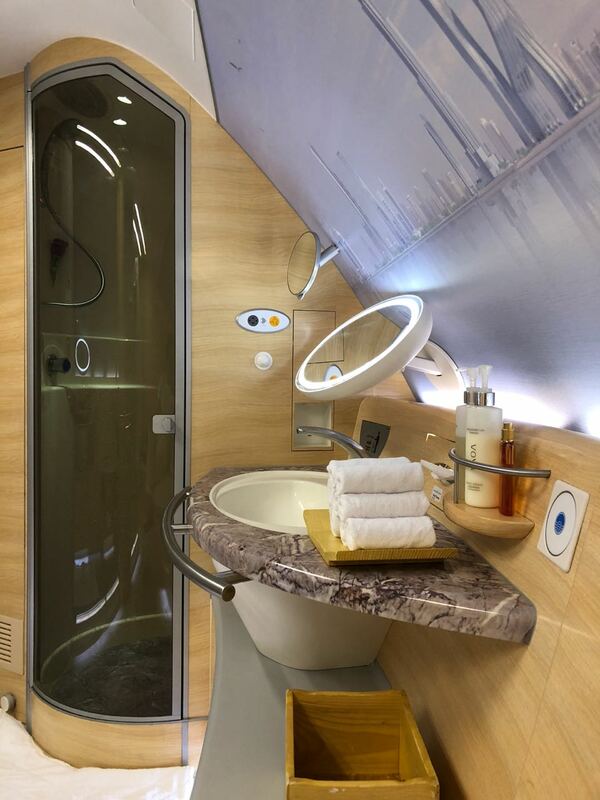 Amused, with the very carefully shared instructions by Sara, including what needs to be done if there is turbulence, or if the cabin pressure drops while I’m in my shower, I walked my way to the grand shower in the air. Just as I was about to step in I was warned, “ do not press the amber light, for we will let ourselves in, as that is an emergency call button which indicates that you are in need of urgent assistance.” When I did lock the doors of the First Class bathroom, I was overwhelmed with the ampleness of the space, the heated floor, t he soft and fluffy white towel rolled up for my use and the spa shower products, which had so neatly been laid out in a tray for me to use. 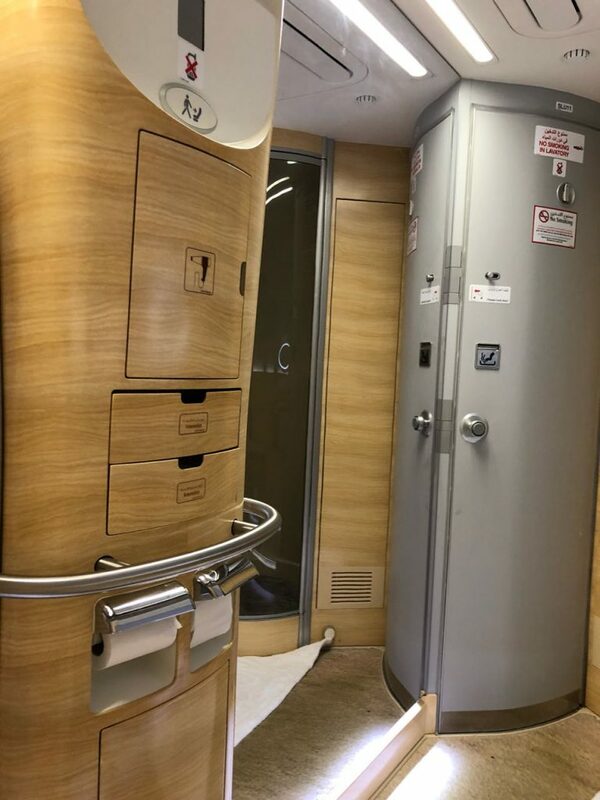 Emirates even provides a hair dryer for that feeling of a complete shower experience. What followed over the next 30 minutes, was sheer bliss and if I may say so, geared toward the ultra jet-set elite. I of course indulged, and came out feeling fresh and rejuvenated. 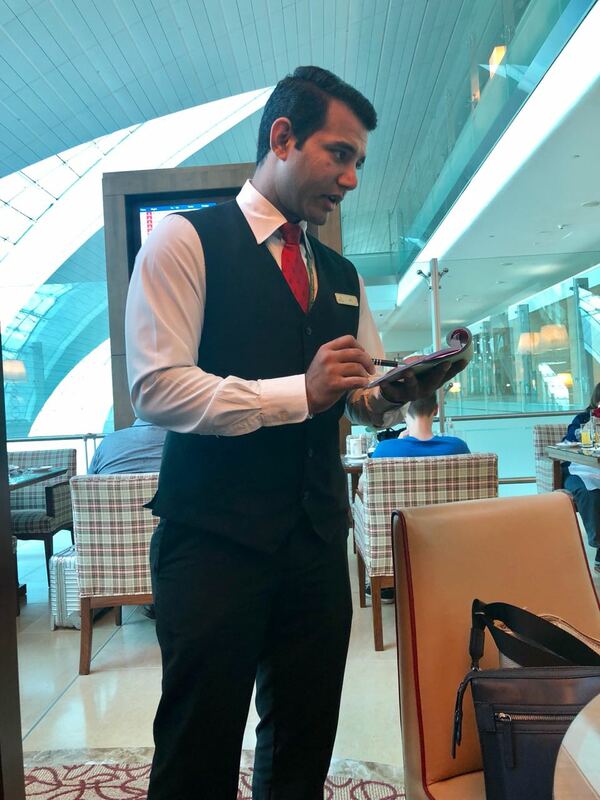 When I returned to my seat, Laveena said that I was looking visibly relaxed and refreshed and she even commented that she approved of the Men’s Eu De Toilette which I had generously splashed over myself. Also awaiting my return was my post shower fruit plate along with a bottle of Voss Water. 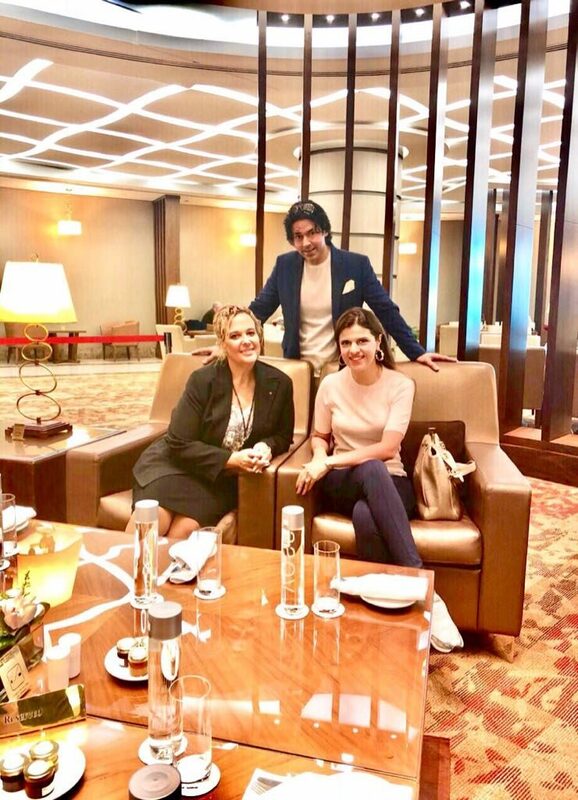 The bar in the First Class area is quiet and a little cramped, and given the flight time to San Francisco, Laveena and I decided to walk over to the bar and lounge area located behind business class and spend some time there. The young and lovely Georgia Pemmeleton, was serving at the bar. While Laveena chose to hydrate herself with a glass of Perrier with a slice of lime and lots of ice, I asked for a glass of champagne. 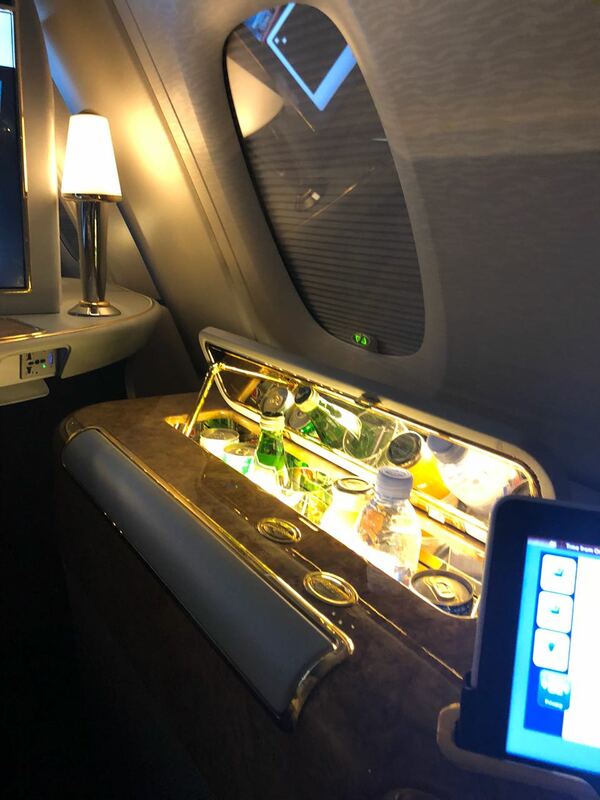 They weren’t serving the Dom P2, but yet, another lovely and courteous young stewardess, Danielle Kane, from Scotland, offered to bring me my choice of drink from First Class. We spent some time chatting with Georgia, Danielle and the effervescent Lyndsey Herft, also from the UK, and commended them on the hard work they, as crew did on these long haul flights. And that too with such a warm and genuine smile. 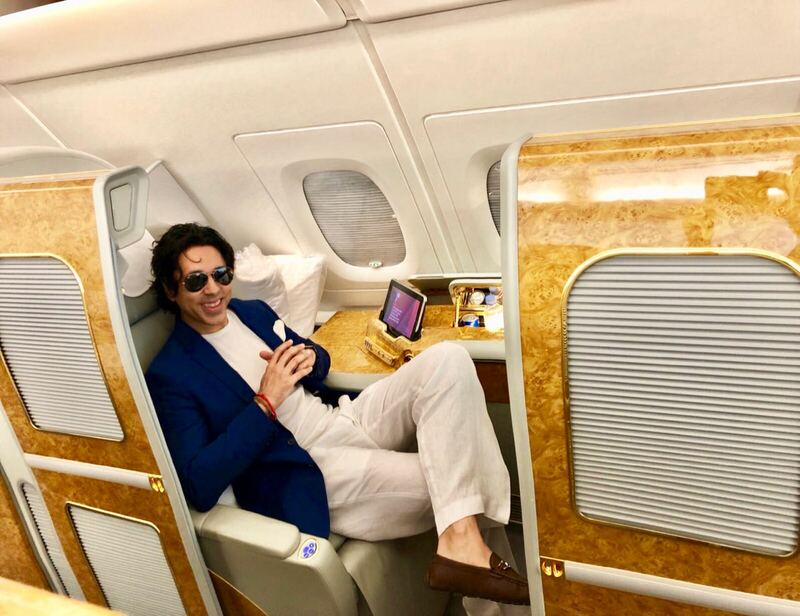 The one area where Emirates can improve, is in their on board meal choices. 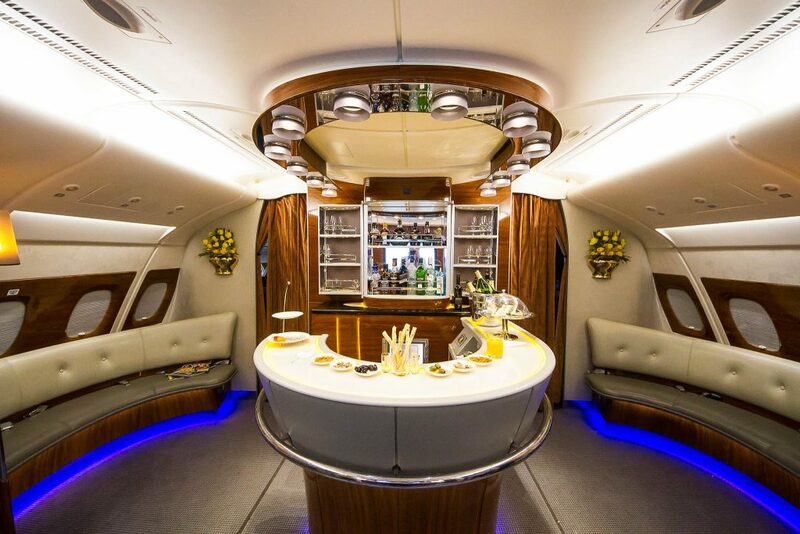 Some of the competition boasts Michelin Star Chef meals both in Business and First Class. 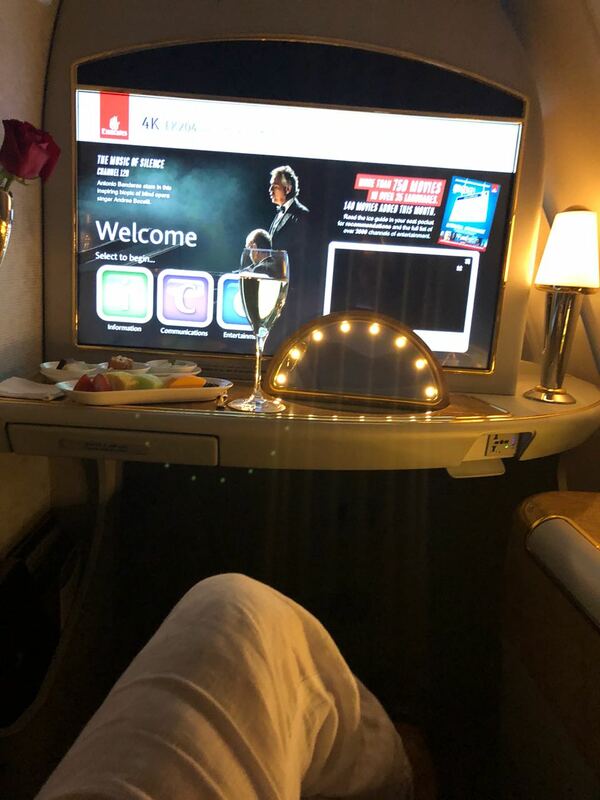 On board the Emirates A380, the fish I ordered was overcooked. The fabulous crew of course, did offer to replace my meal, but the meals fell below our expectations. All in all, the first class experience is indeed very impressive. 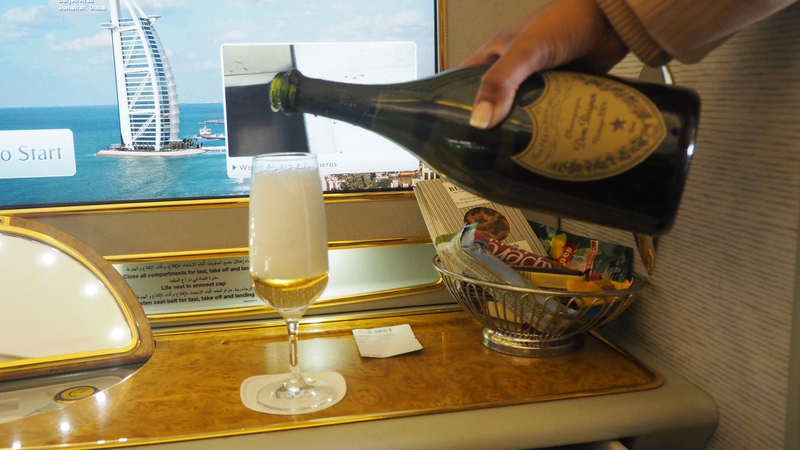 Feasting on the vintage Dom from within the privacy of your suite, with the screen doors shut tight, there is that warm and fuzzy feeling of soaking in the vastness of luxury in the skies. I have to say it not only feels good, but it needs to be experienced by all who can afford it. Thank you Anup :-). 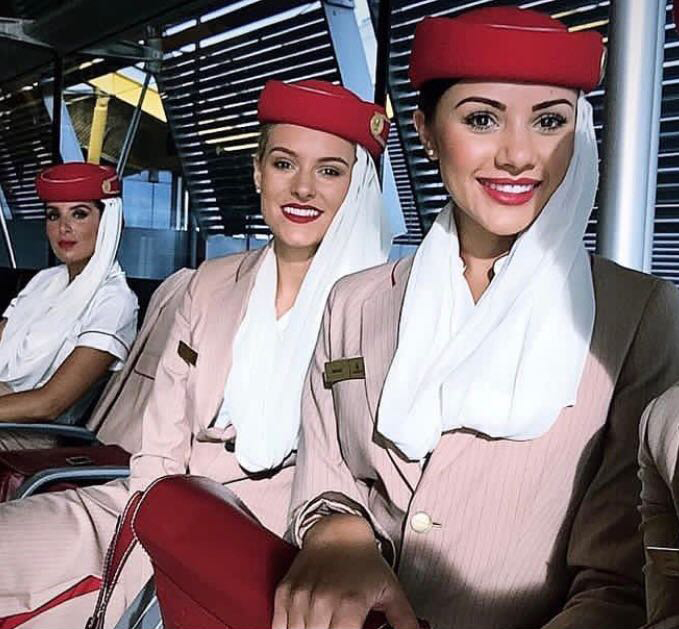 Do share your experiences on Emirates when you fly them next. I am yet to fly Emirates but I have always heard glowing reviews. After reading your post especially, I’m keen on booking my next flight with them. 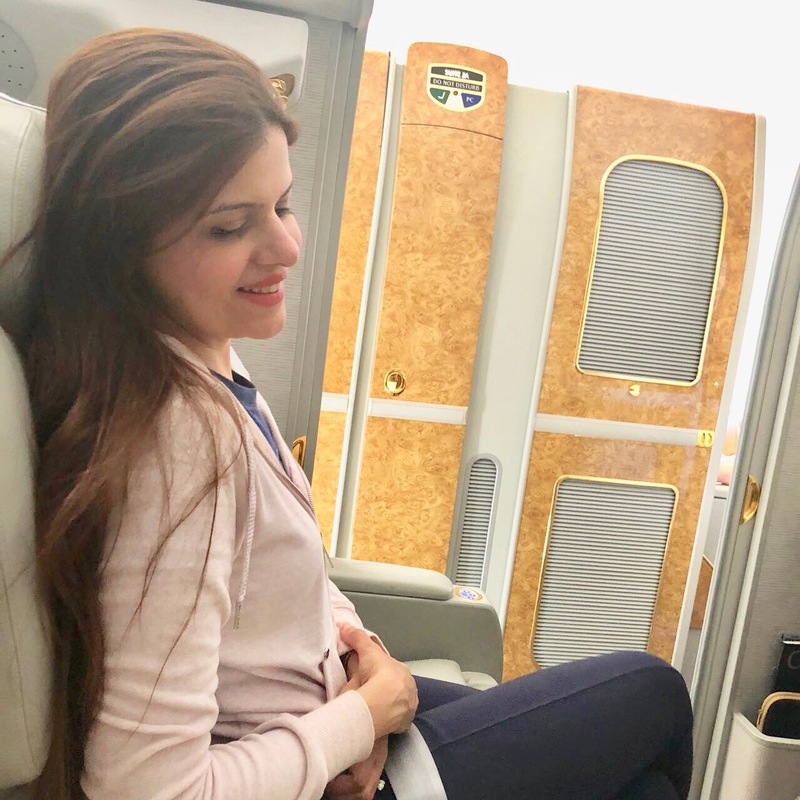 Wow, what a luxurious experience that was, Emirates is indeed a synonym of Luxury. The spa treatment at first class lounge was absolutely a Whoa for me! Woah . We call this royal treatment. Loved the write up. Thankfully for sharing and the pictures are wow.